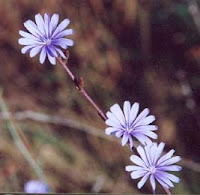 The original name of this plant is Chicory (Cichorium intybus), but it is also known as blue sailors, succory or coffeeweed. This plant can be found growing in the wild mainly in North America, Europe and Australia. It is a perennial and can grow up to approximately 3 feet tall, with mainly lavender or blue flowers. White ones can occur as well although that is very rare. The plant is popular for its roots which are baked and grounded and then added to coffee to enhance the flavor. Even though the taste is rather on the bitter side it replaced coffee entirely during the Great Depression and WW II when real coffee was hard to come by. The roots also contain Inulin (simple sugars) which is used more and more by the food industry as a natural sweetener. Since it has hardly any impact on blood sugar levels it lends itself excellent for diabetics and other sugar related conditions. Inulin is also accredited with increasing calcium and possibly magnesium absorption and stimulating the growth of intestinal bacteria. Apparently, the entire plant contains some volatile oils which have been proven being a good aid getting rid of intestinal worms and other intestinal parasites. The Chicory flower has many health benefits as well; used as a tonic it is used to heal cuts and bruises and the flower is said to help very well as a treatment for gallstones, gastro-enteritis, loss of appetite, constipation and sinus problems. Chicory root is also high in soluble fibers and used as a high-fiber dietary supplement. For people who are rather susceptible too much of it can lead to gas and bloating. That is often why products which contain inulin will sometimes include a warning to be careful not to 'overdose'. The intake is recommended keeping it lower than 0.5 grams/serving. Although Chicory has no real known bad side effects but bloating and gas, it is not recommended for women who are pregnant or breastfeeding and for people with gallstones. As far as any interactions with other medications go; I could not find any. I would advice you though to ask your physician about it if you are intend on taking this as a supplement or substitute. The flowers appear around July and can last up untill October and it would be a good time to pick and use them then. You can try drying them for later usage, although I am not sure how that would work out; it could be a wasted effort because the beneficial but volatile oils may have fleeded. The grass withers, the flower fades, But the word of our God stands forever."